So I kind of need a vacation. Desperately. Unfortunately, basking on the beach on a tropical isle is just not in the cards right now. So, in the meantime, I whipped up a batch of these lovely tropical treats to tide me over. 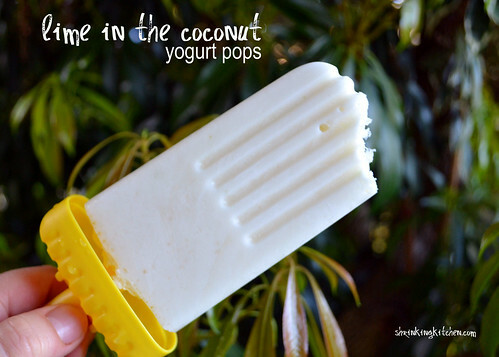 Light and tangy, these yogurt pops are a perfect escape. Lime and coconut just go SO well together. I just need to figure out how to make these with rum and I’ll be set. Excuse me while I go lounge by the kiddie pool. Divide mixture between 8 popsicle molds. If you don't have popsicle molds, you can use disposable cups and popsicle sticks. Freeze until solid (probably about 6-8 hours). Remove from mold (you may need to run under warm water) and enjoy!